I Me My: "Survival" - An Artist's Definition. 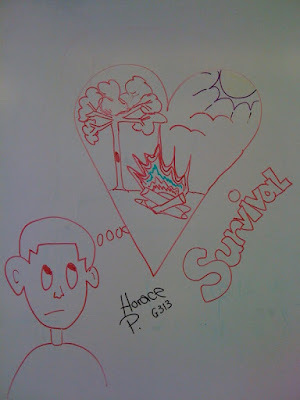 "Survival" - An Artist's Definition. What do you make of the above and this? bringing fears of a tsunami ! He works musical magic with those limited and unconventional resources doesn't he. ...those are some furious forces of survival at work! I had to laugh, he reminds me of my grandson. I saw that money bucket, looked like he was doing pretty well. I hope the young man makes enough money to get a set of drums. Your response to the drummer was no different from mine until I read how much he makes a day, and that was pretty much his income for the day since he is unemployed and lacking any job skills that would help him survive! How are you.I just stopped by to say hello. It reminds me of how easy we tend to forget what things are important or fundamental, and how quick we get lost in details that are not essential and waste a lot of mind time thinking about the unimportant problems related to them. It is important to differentiate what we want (or think we do) from what we need. A Blanket that Covers or a Cover-up?